Today, my ragingly hot boyfriend, Jessie, and I celebrated 8 months of being together! It has truly been an awesome almost-year. Who would have thought he could put up with me and my crazy voices and faces; weird revelations (“this store smells like a cinnamon candle and glue”); addictions to cupcakes, magazines, American Horror Story, and Mannie; the fact that I agonize over what outfit to wear the next day and ask him his manly opinion on accessories and color/pattern combinations; and my typical Hayley routines (waking up god-awfully early; going to sleep grandma-ish early; eating every 16.7345 minutes, etc). So: is anyone else stoked for Thanksgiving? I mean, I know I am. I get two this year. Ahh, the perks of having a boyfriend– extra holiday food. Thanks again for being my boyfriend, Jessie! I’m generally a huge fan of turkey, because turkey is underrated any other day of the year and I really get sickened by chicken if served too frequently. Why don’t people regularly roast turkeys? Blasphemy. Buuuut to be fair, I’m also partial to the sweet potato casserole (whoever thought of marshmallows on top of potatoes was GENIUS), rolls (because bread is always wonderful for any purpose), stuffing (more bread, duh) and obv, dessert. Hello, who did you think I am? I hated pumpkin pie for awhile, only preferring skimming the whipped cream off the top and disinterestedly pushing the plate with an entire slice of de-whipped pie as far away from me as possible. I prefer apple pie (still do) but I’ve since learned to reform my pumpkin ways. Now I’m kinda borderline obsessed. How can someone not like pumpkin? Fall is like, pumpkin’s season. Everyone needs to embrace the pumpkin, love the pumpkin, appreciate the pumpkin. You hear me? So I made Pumpkin Spice Blondie Bites. Because everyone’s celebrating pumpkin, and it was the right thing to do, since you know, this is pumpkin’s prime time. And because I couldn’t not buy the seasonal Pumpkin Hershey Kisses. I mean, that’d be criminal. 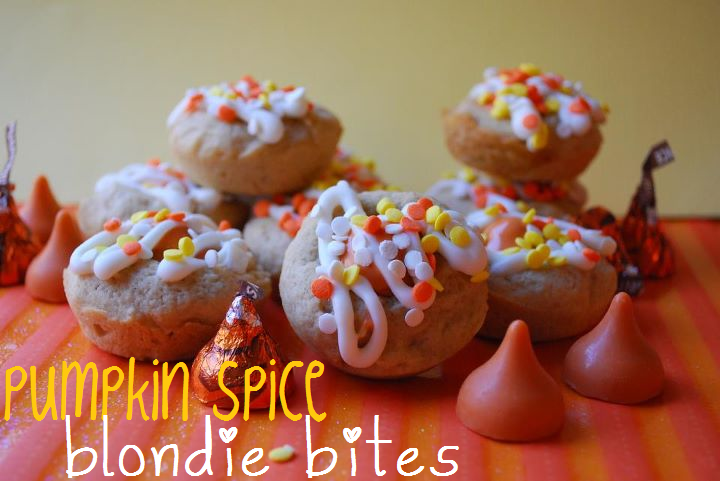 I got the idea for these adorable baby bites from Shelly over at Cookies and Cups. She made some delicious looking Rolo Pretzel Blondie Bites and I was so taken away by the simple idea of baking blondies in a mini muffin pan that I had to do it myself. Thanks, Shelly! And justsoyouknow, while these won’t work in lieu of an actual pumpkin pie at Thanksgiving (super sad, right?) but they will make for awesome little bites for after dinner or in-between real-dessert-bites because that should be allowed, just sayin’. They’ll also wrap up nicely for gifts, if you wanted to be especially friendly and spread around the pumpkin looooove (which also should be allowed). 1. Preheat oven to 325 degrees F. Lightly grease a mini muffin pan with cooking spray; set aside. 2. In a large bowl, beat together butter and brown sugar until creamy. Beat in egg and vanilla until blended. Gradually add flour, 1 cup at a time, followed by the pumpkin pie spice, and beat well after each addition until a soft batter forms. 3. 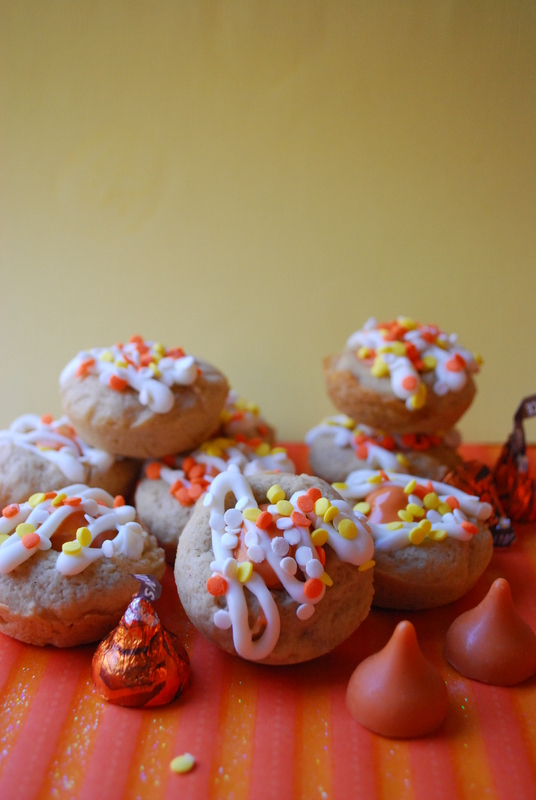 Drop batter by tablespoonfuls into greased mini muffin cavities. Spread around the cavity to fill completely by using a greased finger or spoon. Bake about 10-12 minutes or until golden and set. Allow to cool a few minutes. 4. While blondie bites are cooling, take a small spoon (or use your thumb) and make a slight indentation in the top of each bite. Nestle an unwrapped kiss in the indentation. Pop back into the oven for about 1 minute until kisses are softened and slightly melted. Allow to cool in pan completely, then transfer to a wire rack to drizzle. 5. Melt white chocolate (I used leftover Candy Bark) and drizzle it over the blondie bites in a snipped ziploc baggy. Top with festive sprinkles and allow white chocolate to set before wrapping up. Store airtight. Ahhh thanks Shelly! You’re so inspirational to me! I am so enjoying all of your blogs! Great recipies but most of all your gift of writing is what I look forward too! Please invite us to to the grand opening to whatever “Big” you make. This I know for sure! Keep writing and we will keep drooling over all the yummy ideas you have. Thank you, Leslie! And thanks for stopping by. xo. 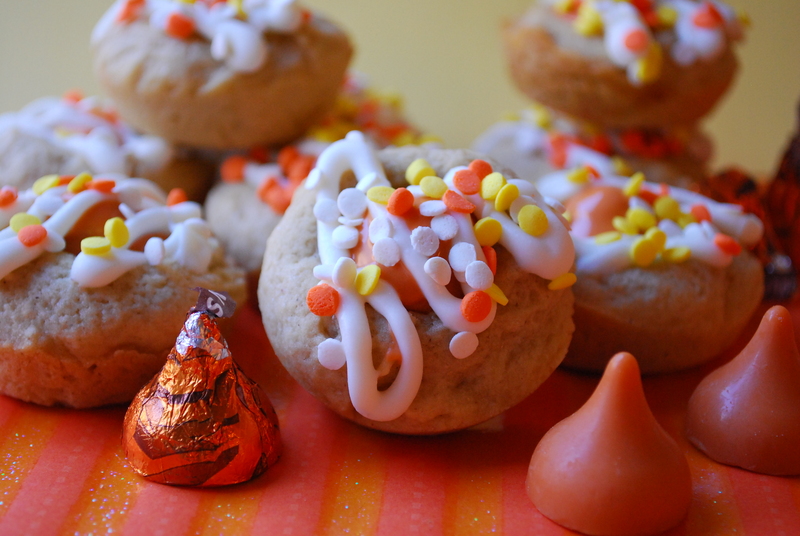 i’ve had this pinned for like a year now, because when i found it the pumpkin kisses (which i had never heard of) weren’t in season. but today i saw them at target and actually squealed. i’m so excited to make them! Yay! 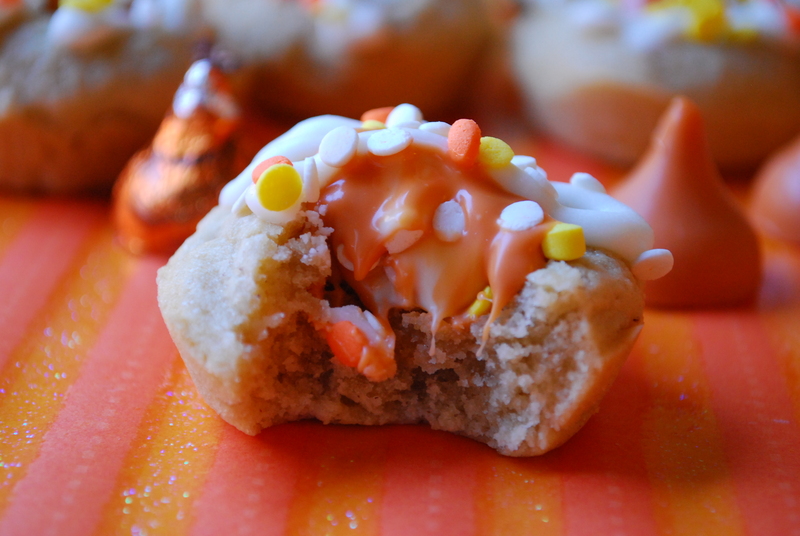 I wish the pumpkin kisses were year-round (because hello, that’d be freakin’ sweet) but at least now you can try ’em out. 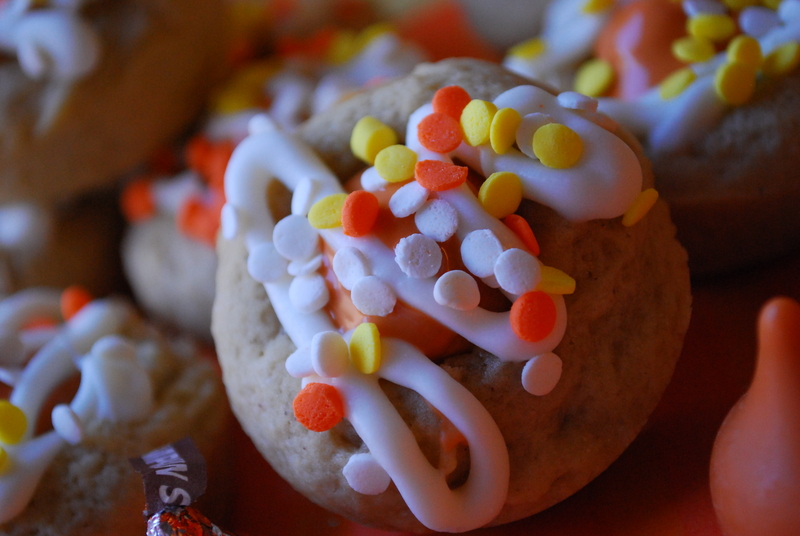 I am SO glad it’s fall baking time! Enjoy!